When I first started collecting Hamiltons I was drawn to the CLD line. I'm not sure why... perhaps it was because there were a finite number of CLD models so it seemed achievable. Over a couple of years I acquired all of the more common models... the Nordon, Langdon, Brandon, Croydon, etc. and even quite a few with the less common dial options... like a black Brandon. However, eventually I was forced to capitulate - as the remaining models were either solid gold, extremely rare, or both! It wasn't long after that I was drawn to the Stormking line of watches. Again - there are quite a few models to collect. In fact, there are 12 different Stormkings, ranging from Stormking I to Stormking XI (with two IV variants). Sounds pretty do-able, right? Well, not if money isn't an issue, I suppose. You see, Stormking I is solid 18K gold and several others are solid gold too. They're all nice looking watches though so even getting a couple is a nice objective for any Hamilton collector. The Stormking IV and V are probably the most easily found, especially the former. By sheer luck, I recently stumbled upon a Stormking III and jumped at the chance to get it. 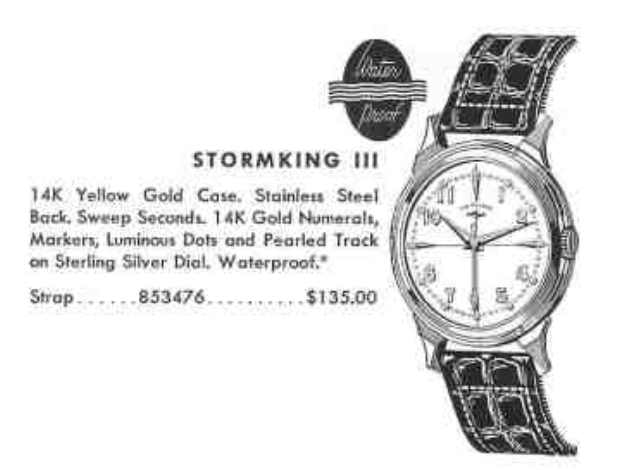 The Stormking III was introduced in 1955 and made for four years. All of the first five Stormkings have a very similar case design. The II and III are 14K gold. The III has a stainless steel back though. The IV is gold filled and the V is stainless steel. The Stormking III came with a two-tone "BMW-style" sterling silver dial with solid gold markers, numerals and luminous dots. It has a lot going on with respect to dial features. Under the dial is an American-made 8/0 size 18 jewel 748 movement or a 735 movement, depending upon if it's an early example or later example. The 735 replaced the 748 in 1955. My Stormking III project watch arrived in classic project watch condition... pretty dirty. The crystal had a small crack but otherwise it looked like it would clean up fine. The bracelet it arrived with looked like something that could have been period correct - but it's a Speidel bracelet and that manufacturer was rarely used by Hamilton. It's certainly not original to a Stormking III - as that came only on a strap. The back of the watch is stainless steel and it screws into the 14K bezel. There's no problem identifying this model, assuming you can get the back off. The serial number on the 748 movement dates the movement to 1954 - so I suspect this is an early example of a Stormking III. It's held in place by a gasketed movement ring and once I remove the stem the whole assembly can be drawn out of the bezel. The dial is original and in great shape. There's a little toning in the center from the radium on the hands but not enough to be a distraction. I'll remove the radium in the ultrasonic cleaner and return it to the earth from which it came. See, nothing on the back of the dial to indicate that it's been refinished. This would be a tough dial to get redone - it's possible but there are a lot of minor details that would be hard to replicate. Everything is cleaned and ready to be reassembled. These 8/0 size sweep second movements can be a real challenge to get back together. I don't have too much difficulty now days but back when I first started this hobby, this particular movement often drove me to tears... it can be that frustrating. ... and a little tweaking gets it right in line. There's nothing to complain about this watch's performance. It doesn't get much better than this.